The Blue Tigers will be locking horns with the national football team of China in a friendly after 16 years. The coming Saturday, October 13, will witness the 'historic' match. It is historic in the sense that this will the first time the Indian National team will be playing The Dragons on their soil. Most of their previous meetings have either been on Indian soil or elsewhere. The upcoming International friendly is of paramount importance as it will help the Men in Blue gear up for the AFC Asian Cup which is slated to kick off in January next year in the United Arab Emirates (UAE). 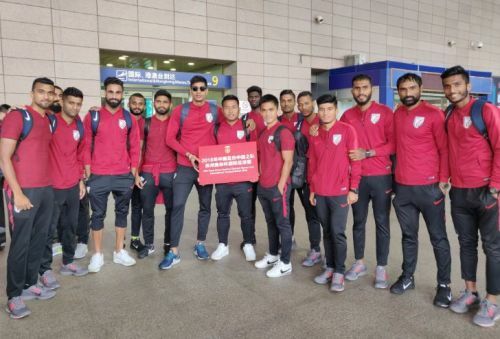 Stephen Constantine has announced the 22-member squad and they have already landed in China. The meteoric rise in India's FIFA Ranking was earlier credited to playing friendly matches against weaker opponents but such is not the case with China. While the Blue Tigers are currently ranked at 97th place in the FIFA Rankings, The Dragons are at the 76th position. Not only will this be of good exposure for the Indian team, but the match also rejuvenates the long-lost rivalry between the two neighbouring nations. In this article we take a look at 5 historic matches played between the two nations and also the head to head results overall. Yes, India have never been able to overpower China but the squad picked this time around has the best chance yet. The Blue Tigers also maintained an unbeaten streak of 14 matches before going down against the Maldives in the final of the SAFF Championship 2018. However, a relatively young and inexperienced squad had been fielded for SAFF but the one against China is full-fledged with the best of the Indian lot. This was the first match Independent India played with their Chinese Counterparts. The match was hosted in New Delhi, India, and ended up in a 1-0 win for the visitors with Cong Zheyu being the only goal scorer of the match. The encounter was a part of the 1974 Asian Games and the venue was Tehran in Iran. It ended in heartbreak for the Blue Tigers as they were handed a 7-1 drubbing by China. The Chinese team was extremely ruthless. Wang Jilian and Li Guoning scored a brace, while Liu Qingquan, Rong Zhixing, and Chi Shangbin all scoring a goal-a-piece for China. It was a disastrous Asian Games campaign as India lost all their matches in Group B. The other two were a 0-3 and 1-4 losses to Iraq and North Korea, respectively. Magan Singh Rajvi was the player to score both the Indian goals in the entire campaign. Can China Win The Football World Cup By 2050?